Today's the day. Earth Hour has begun in certain time zones. You can go and check out the "Earth Day Live" pics on their website to see it as it unfolds! If you're still looking for ways to celebrate and be part of the hour long dark "wave" of activism in your time zone between 8:30--9:30 pm tonight, check out the list below. You'll be in good company with over 7000+ cities, 160 countries, historic buildings, and global landmarks world wide have committing to this small symbolic act, unifying a dedication toward building a healthier planet. 1. Sit on the coach by the fireplace with a good book or loved one. 3. Play board games by candlelight or flashlight. 4. Play backyard games with your kids like Ghosts in the Graveyard, Flashlight Tag, or Hide & Seek. 5. Build a backyard bonfire & toast your toes &/or marshmallows. 6. Go on a night hike. 7. Go camping in your back yard. 8. Enjoy the start of spring by stargazing. 9. 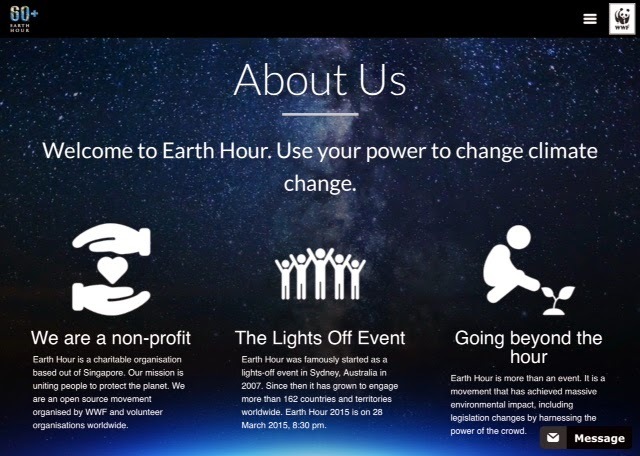 Donate to one of Earth Hour's environmental crowdsourcing projects. 10. Use it as an opportunity to teach your loved ones that small gestures & actions can indeed lead to being a part of something bigger.